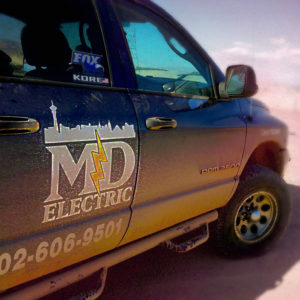 MD Electric was established in June of 2011 and we take pride in being a family owned locally operated company. Qualifying electrician and Project Manager, Matthew K. Dustin, has over 16 years of experience working as an electrician in the Las Vegas area. He began his career in residential and commercial wiring after graduating Area Technical Trade Center of Las Vegas. After completing five years apprenticeship at the NJATC Matthew worked as a Foreman for G&G Systems and Fisk Technologies on the Las Vegas Strip. Matthew has overseen projects at Wynn-Encore and tenant improvements on MGM/Mirage properties, Caesar’s Palace and other high-profile resorts. Matthew went on to work as General Foreman and Foreman for Shaw, Stone and Webster at the Harry Allen power plant north of Las Vegas. In the past five years, under the management of President and owner, Erin Dustin, we have been a part of casino remodels at the Venetian and Tropicana; built new Cantor sports books at several strip properties; and completed multiple tenant remodels and built-outs at Fashion Show Mall, Forum Shops and Crystals. We provide electrical services for McCann Systems and Daktronics which includes fiber installation, termination and testing, and video wall installation. We also provide service for Lawyer Mechanical Services for VFD install, boiler and chiller electrical maintenance, and retrofit. MD Electric, Inc’s low overhead gives us the advantage of providing high-quality, dedicated electrical service at a competitive rate. We are Siemon Certified and Corning Fiber Certified.